Who hasn’t reached for a pen only to find that it’s all dried out and doesn’t work anymore. Did you know most pens can draw a line nearly two miles long before running out of ink? Yeah, we’ve never gotten nearly that amount of use from a pen before it dried out either. 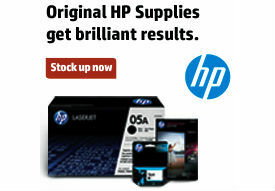 Luckily, you can revive dried out pens. Easily. 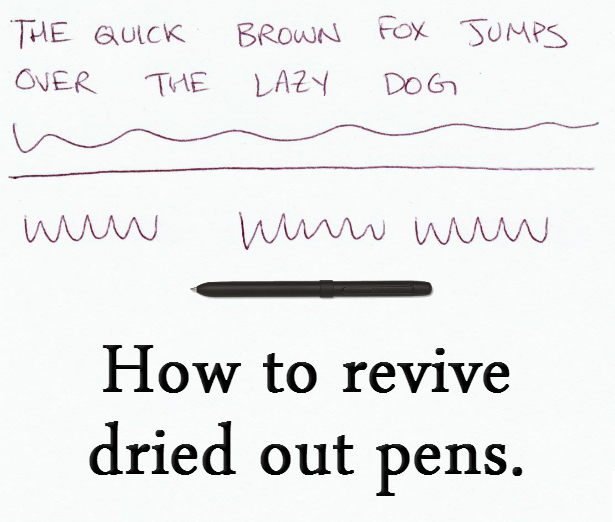 So before you toss your scratchy pen, try our 5 tips on how to revive dried out pens. Soak: dissolve dried ink on the nib by soaking your pens in a cup of hot water or rubbing alcohol. Forced air: remove the ink cartridge and blow on on the clean end to force ink to the nib. Scraping method: remove the dried ink clogging up the nib by rubbing your pen on the bottom of your shoe, a damp cloth or an emery board. Fire: Hold your pen tip to a lighter flame for a few seconds to melt dried off a ballpoint. Rod it out: use a straightened out paper clip and a drop of nail polish remover to clear out the dried ink clogging up the ink cartridge. If you try all these tips and your favorite pen is still well and truly dead, you may be able to just replace the ink cartridge. Know another way to revive dried out pens? Share your tips in the comments. I would really love to win the supplies contest, as our district has a 9 million dollars deficit (very poor management/communication from district) and we are suddenly left holding the bag. Like other teachers, I already spend thousands of dollars a year, so any little bit of help with supplies would be wonderful. My Kindergarten class is my pride and joy and I’d hate to come up short with supplies. this a great blog! I love the helpful hints!! I’m glad your contest got me here to become a regular reader! Lick the nub of the pen to remove dried ink from the tip, or the lick can re-wet the in in the pen. Or you can point the pen at a distant object, and swing your arm in circles, using centrifugal force to make the go to the nub. This will work for dry erase markers as well. I tape a piece of string to the end of mine and give it a whirl or two. Not too many, or the ink will spill onto your hands when you take off the cap! I have a container of water next to my desk to help humidify the area. Just touching the tip of the nib in the water is usually enough to get the ink flowing again. Great tip, Frank! Thanks for sharing!! I have a very large quantity of pens that are dried out. Do you know if pen ink is alcohol based or water based and do you have any good tips to get them working as a batch. Hi Tony, thanks for your question. Rollerball pens, for example, typically use a thin, water-based ink. Many manufacturers use water-based inks for pens. However, felt-tipped pens need ink made with alcohol for a solvent. Have you tried any of the methods described in this blog post yet? So, if you feel you can do this safely and all else has failed. Thanks for your advice & safety tips! The first is to hold the tip to a water sprayer and pump it a few times. Note: make sure it&apos;s not water-based and it&apos;s waterproof. But you can cap for a few hours so the water will evaporate. The second way is to use pliers to remove the tip then load a syringe and needle with ink and inject it into the tip and the edges connecting the tip to the cartridges. Those should be used for extremely dead pens. Paint markers! I have a large amount used for a school project. Tons of paint left in each. Tried wiping the tips with paint thinner, shaking, waiting, removing nib…. I see above you noted nail polish remover and a paper clip – is this for paint style markers? I would assume paint thinner or nail polish remover would work equally, but I&apos;ll take any suggestions / advice to get my money&apos;s worth out of these pens!